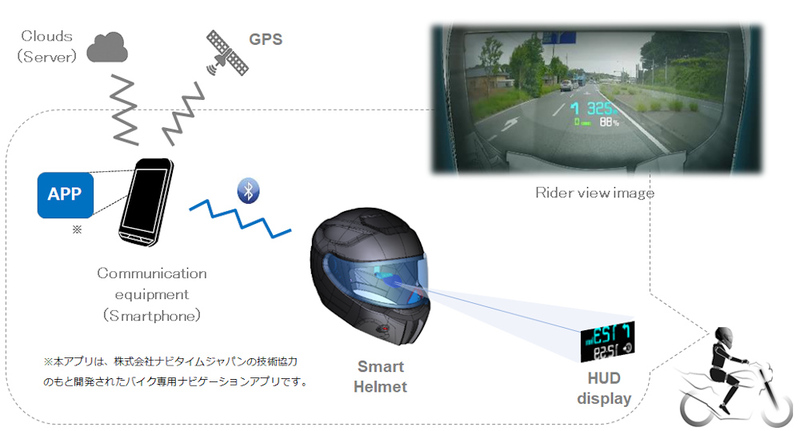 Shoei Co Ltd, a Japan-based major helmet maker, will commercialize a motorbike helmet equipped with an HUD (head-up display) for navigation in the spring of 2020. The helmet, "Smart Helmet for Motorbikes," was exhibited by NS West Inc, which is a manufacturer of automotive instruments and HUDs and a partner of Shoei, at CES 2019 last month in Las Vegas. NS West is a manufacturer that is based in Hiroshima Prefecture, Japan, and supplies instruments and HUDs mainly to Mazda Motor Corp and Daihatsu Motor Co Ltd. It started new business development in 2014 and focused on HUDs for motorbike helmets, considering that the company's technologies of and knowledge about automotive HUDs can be utilized. NS West not only designs and develops automotive HUDs but also conducts resin-based exterior coating, mounts electronic boards, assembles HUDs, develops software and establishes systems in house. And it considered that the comprehensive strength would be helpful for new development. The automotive HUD is a completed product, and NS West has knowhow to develop measures for EMC (electromagnetic compatibility) and make GUIs (graphic user interfaces) for the product. On the other hand, when, for example, a smartphone is used with a motorbike for navigation, it is placed closer to the rider than the motorbike's instruments. So, if the driver tries to check the navigation screen while driving, the driver needs to greatly move his/her line of sight, causing a risk. Considering that an HUD can show an image within the field of vision from the beginning, the company judged that there are demands for the helmet. However, NS West does not have knowledge about helmets. So, aiming for a partnership from the beginning, the company contacted three Japanese major helmet makers. As a result, Shoei, which has been focusing on multifunctional helmets, readily agreed, and they started the development. The HUD for motorbikes, which the two companies are commercializing, is a "combiner type," which uses a transparent display board on which an image is projected. Basically, it is the same as automotive HUDs, but its specifications were optimized for motorbikes. For example, an image is seen 2m away from the rider while automotive HUDs display an image 1.6m away from the driver. The image size of the new HUD is 6 inches while that of automotive HUDs is 4 inches. In consideration of opinions from riders such as "complicated display prevents the rider from concentrating on driving and causes a risk," the amount of displayed information was reduced. As a result, the HUD shows only directions, lanes, distance to the destination, weather, etc. Also, each item is displayed with large characters. It does not show vehicle speed, either. The brightness of displayed images was increased from 6,000nit (candela/m2) (automotive HUDs) to 8,000nit, this time. It is because the display board of automotive HUDs is smoked while a colorless display board is used for the motorbike HUD. On the other hand, as in the case of automotive HUDs, the new HUD comes with a function to detect the brightness of natural light with a sensor and adjust brightness in the aim of reducing glare at the time of coming out of a tunnel. For data communications for navigation, a smartphone is used. A smartphone is connected with the helmet via Bluetooth, and a special smartphone application is used. The application was newly developed based on Navitime's application so that its screen becomes suited for smartphones. With a smartphone, the helmet can play music, enables to talk on the phone, etc. The helmet is equipped with speakers and a microphone. For operating the helmet, buttons located to the left of the jaw are operated with the left hand. To simplify the operation as much as the possible, there are only two buttons: one function key and a bar-like button used for controlling sound volume. The function key is used for turning on/off the HUD screen, receiving/rejecting a phone call, redialing, etc. The entire helmet was newly designed, and Shoei was responsible for its design and specifications. Its electronic control system and optical system are mostly stored in the jaw part. So, compared with normal helmets, the jaw part of the new helmet is larger. To emphasize the characteristics of the smart helmet, a matted material was employed only for the jaw part, and screws were left visible on purpose so that the helmet looks like a "machine." As for a battery, NS West expects to use an external battery exclusively designed for the helmet, considering that the battery attached to the upper body of the user will be connected to the helmet. This method was developed based on an opinion of Shoei. It is mainly for reducing the load of the helmet's weight on the user's body, putting weight on the weight reduction of the main unit of the helmet. The weight of the new helmet is about 1,800 grams (large size), and the weight of the HUD unit is about 260 grams (excluding the battery). However, NS West is also continuing to consider a method to embed the battery in the helmet. NS West has been developing the helmet for about three years, after it formed a partnership with Shoei. Safety tests were repeatedly conducted for the first and second prototypes at Shoei. This time, NS West showed the third prototype for the first time. The company aims to start volume production in the spring of 2020. The price of the helmet will be set by Shoei and has not been decided yet. In general, the price of high-end helmets is about ¥60,000, and helmets that can be equipped with a separately-sold intercom device for conversation are sold at a price of about ¥100,000. In view of this, NS West expects that the new helmet will be equipped with safety and security functions and sold at about ¥120,000-150,000. This is Potentially dangerous given the retina cant be both near and far sighted at the same time. So momentarily you take your focus off where you're going to look at the speed-o, and then back again in front of you... it's no different from looking down, infact worse!!! Dont drive too fast period!